Sometimes you want your wheel to turn at the same time as the rod turns (maybe because you are using a motor to turn the rod). This can be achieved by attaching an interlocking clip Side-on to the rod, and sliding it along so that the small projection on the clip slots into one of the small holes in the wheel. Younger children may need helping in putting interlocking clips on and taking them off. You can also use interlocking clips with connectors. In this case the small projection in the clip slides into one of the small triangular holes near the centre of the connector. An example where this approach is useful is in a windmill, where the sails may be made from 8 red rods on a white connector, and you want the sails to turn a rod that passes through the hole in the middle of the white connector. 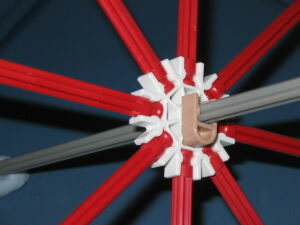 The photo shows a tan interlocking clip attached to a classic K'NEX rod. 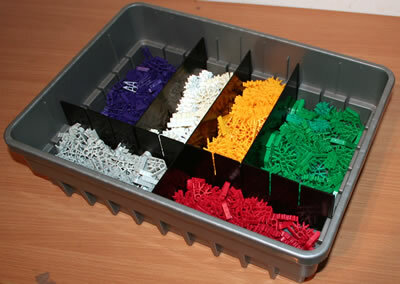 Micro K'NEX interlocking clips are also available. 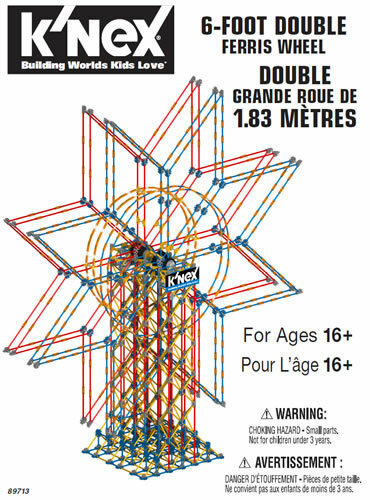 They are usually blue in colour, and can be attached Side-on to any Micro K'NEX rod. 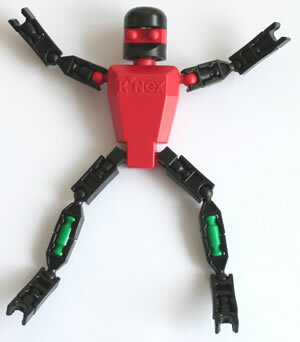 There is a also a version of the interlocking clip which fits onto Micro K'NEX rods. 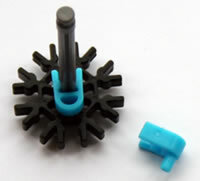 The photo shows the usage of this part to make a Micro K'NEX connector turn with a Micro K'NEX rod.